Colorado Falcon lands in Denver ! The rest of my universe is a total disaster but after months of waiting the Falcon has landed! I can honestly say this was the first time I’ve smiled in 7 weeks. Pam the u-ship gal showed up an hour early and we unloaded in no time. Best of all she was able to take the Thumper back to Terry on her return trip. He will have it in the first days of Feb.
1. It has the best visibility of any of my previous trikes. I can see all points of the compass. For the first time I will be able to look back through the prop and it will be easy to check fuel level. It will be much easier to launch when I can see the wing inflate without using a mirror. It’s going to be great to be able to look behind and see in all the traditional blind spots. I’m thinking that it will be closer to the foot launch experience. 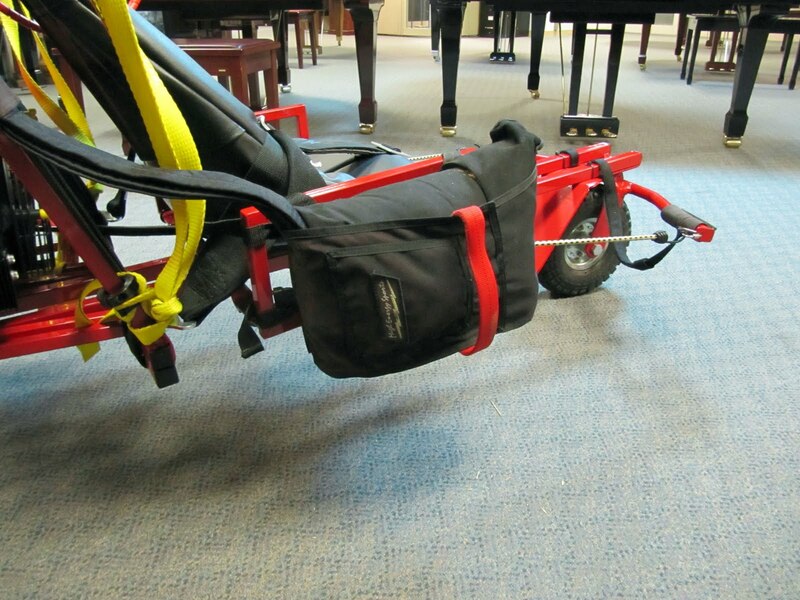 The bucket seat puts you “out there” so… instead of being cocooned inside of a harness or low down in the trike buggy… you’ve got your ”knees in the breeze”, as Brett Cam would say. The forward rail is narrower and the front wheel is out of view which also reduces the “visible stuff” out in front. I’m really looking forward to flying this thing! 2. The bucket seat was a good option, designed for go carts it is very suitable for the Falcon. It fits my small frame great and I think bug guys will like it too. 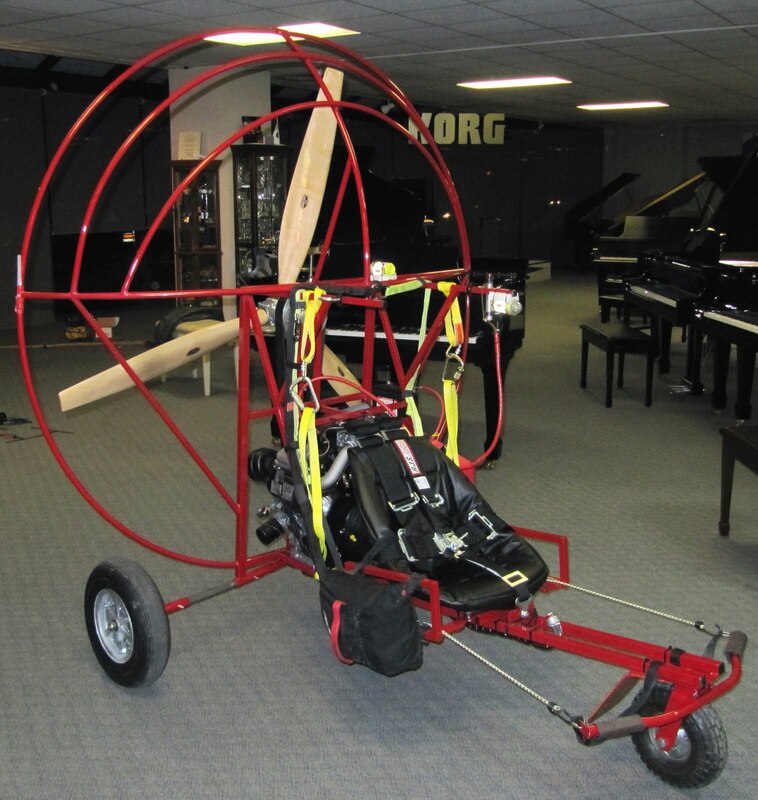 The side rails make great attachment points for the reserve and if I want I can mount a “saddle bag” on the other side for cameras, water, mini parachutes… toys. 3. 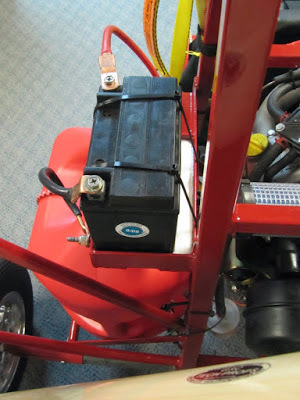 The electric start was smooth but there is no optional pull start like the Briggs & Stratton. It’s not really an issue… since I never had to use the pull start on the Thumper. Terry relocated the ignition to a central point just forward of the bucket seat. Good move since the first thing I did with the side mount was to break the weld. It also does away with the pivoting arm that the switch was mounted to. Last spring I launched with the hang strap inside of the pivot arm. The strap stressed the arm and I killed the motor trying to sort it out. 4. It’s BIG ! With a 66 inch prop and one piece construction the rig is too big to get inside of my store…except for the front double doors. I can’t get it into the shop for hang testing. So… I’ll just have to stop at an elementary school on the way to my first flight. I probably should have had Terry make it so I could remove the cage but it’s not a big deal. I’ll cope. 5. The 5 point seat belt looks like it came off of a Russian tank. It’s 3 inch webbing with rough cast hardware. When I cinch it up I’ll be able to fly but I won’t be able to reach the GPS or do any weight shift. Most likely after the first few flights I’ll ditch the crotch and shoulder straps. The waist belt is very comfortable and I like the way it snug’s me into the bucket seat. 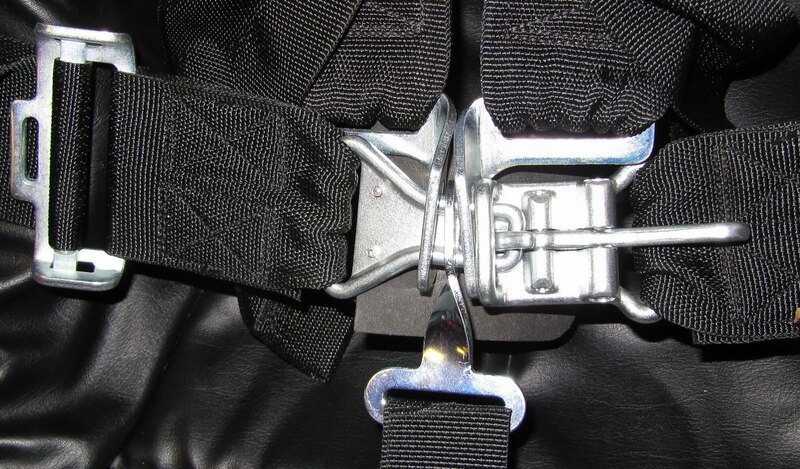 The buckle is primitive but it is a good clean quick release. I’ll braid a lanyard to the Q.R. to make it easy to find in an emergency. 6. I was a little concerned about the wheels but the new mags are bigger than I thought, it will be no trouble rolling over the rough stuff with these babies. Also the rims are split which will make it easy to change out a flat. The front wheel is small so…I might have to use ramps on soft surfaces … Time will tell. I do like the reverse camber of the nose wheel. It will keep it tracking if I decide to be a jerk and take my feet of the pegs… :). 7. The battery came off during transport, so I secured it with zip ties and filled the gap in the battery tray with some stiff closed cell Styrofoam. It will probably benefit from one more Zip tie but it’s not going anywhere the way it is.